Hi from Harmonix development land! With the release date of Rock Band 4 just a day away, we wanted to give you an all-in-one-stop place for everything you need to know about the upcoming release! We have had a blast making this game for you and we hope you have a blast playing with friends, family or even solo. 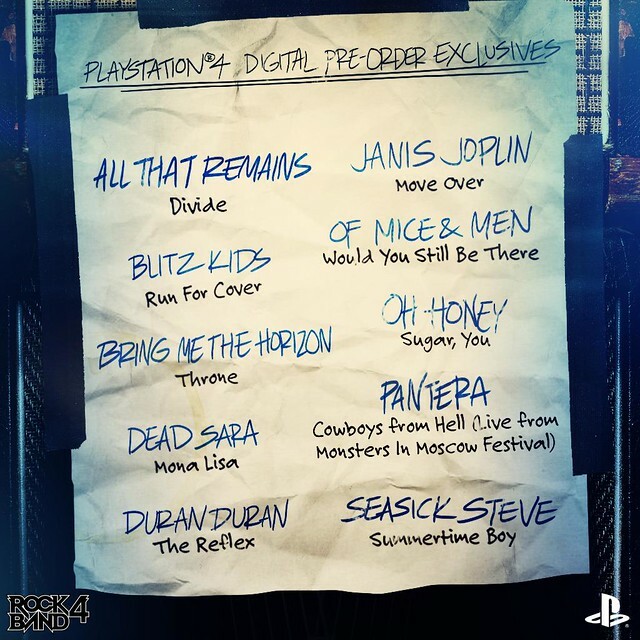 Pre-order Rock Band 4 digitally because we have a phenomenal promotion running for PlayStation Plus folks: 10 awesome DLC tracks that mirror that same diversity as our on disc setlist, including songs from Pantera, Duran Duran, Bring Me The Horizon and more. While these songs will soon be available for purchase, PlayStation Plus fans that preorder can get them free of charge (as well as have the game set to automatically download to your console on launch day). And if you have your Rock Band PlayStation 3 controllers or most other PlayStation 3 music game controllers, you will be able to play Rock Band 4 with your existing hardware. 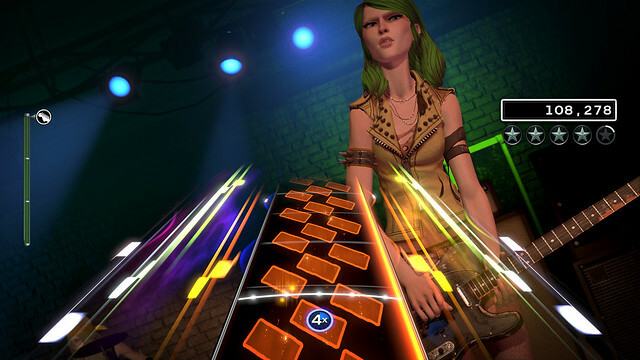 Rock Band 4 is chock full of innovations but the feature we’re most excited about is the Freestyle Guitar Solo feature. With Freestyle Guitar Solos, you get to bust out your own awesome guitar solos. While we’ve adhered to our principles of accessibility to make it easy to sound great right away, we’ve also built a system with gameplay and depth – it’s a new way to play Rock Band that fits right into the core fantasy that makes Rock Band great. We’ve developed a lot of great tech to make you sound awesome all the time while crafting totally individual, face melting solos. The drums have also taken a step forward with a more durable kick pedal, more responsive and quieter drum heads, and a new cymbal pack that will be available for purchase shortly after launch. Finally, we’ve developed a brand new microphone that allows for more gain with less distortion – sing louder and be heard! Our back catalog of over 1500 songs has been updated with new gameplay, so that every song now supports all the new Rock Band 4 gameplay features. On top of that, you are entitled to just about any Rock Band DLC you might have purchased on the PlayStation Network. You can re-download into Rock Band 4 any DLC you previously purchased on the PlayStation Network for earlier versions of Rock Band. Best of all, this is free – no need to buy songs for the 2nd time. 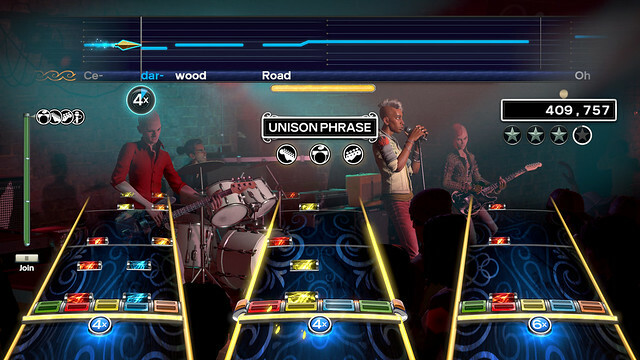 Additionally, most previous PlayStation 2 and PlayStation 3 wireless music game controllers from Rock Band and other franchises will work with Rock Band 4 on the PlayStation 4, that’s without needing any other additional equipment. So if you want to add in a few more folks to the party, you can use the stuff you already own. To find out all the details, take a look at our detailed compatibility chart here. If you like to sing, you’re in luck. We’ve completely revamped the singing game, adding a new feature called Freestyle Vocals. Freestyle Vocals rewards you with a points bonus for improvising – as long as you are singing in the key of the song, you’re good! It’s a great feature for people that like to sing. We’ve updated all the major modes of play, from the classic QuickPlay mode, to a new ‘Shows’ mode that introduces dynamic setlist voting (never lose friends over what song to play next again), to the revamped campaign. So the classic band gameplay you love is still there. Lastly, just in case it isn’t clear, we are 100% committed to the Rock Band franchise. We want to work with you, our community, to continue to build upon this game. Let us know what you think! Rock Band 4 was built from the ground up based on the features the most fans wanted, and we’re always happy to hear where you think the franchise should be headed. We’ve got an aggressive schedule of feature updates and weekly new song DLC for after launch, so stayed tuned from us as well. We have loved seeing you guys rock out at events across the nation this spring and summer, and we can’t wait to see what fun folks have with the final game, as you all discover and rediscover the joys of being Rock Gods. More Van Halen & ACDC please……true Rock Bands!! Now for the burning question: How will we be able to transfer on disc soundtracks from Rock Band 1-3 into Rock Band 4? Also needs more Led Zeppelin. If you’re previously exported legacy Rock Band titles, you will be able to re-download this content for free in Rock Band 4 within the same console family as we make that content available. At this time there is no way to directly export legacy Rock Band disc set lists into Rock Band 4. Yes you can, just not day one. will there be a way to rebuy the export? i paid to transfer from RB1 to RB2 but never got around to transfer from RB2 to RB3. I’d also like to port over my RB3 songs too. ..and my rock band beatles songs for that matter, that one was my favorite. anyways,.. just in general thanks for being backwards compatible with instruments and dlc. it made pre-ordering RB4 a pretty easy decision. I have problems connecting my old instruments to RB4. Do I need the dongle or can I connect via device manager under the Bluetooth management on the PS4. Nothing works not my old RB3 controller, my Logitech or my guitar hero controller. That tells me I am doing something wrong. Please give me some advice on how to connect my old instruments to use with my new game and new controller as it was bought because I was told it would work. Any update on when are legacy DLC packs are going to be fixed? Have only been able to download songs to my ps4 that I have bought individually. Songs I’ve bought in packs, I can’t download. Also, which games are we going to be able to export to RB4? (I know The Beatles won’t). Legacy packs are continuing to be sorted out on the back end. Keep in mind that this is NOT our entire backlog of DLC that’s currently available in the store yet! Content will be added as we make it available, hold tight! 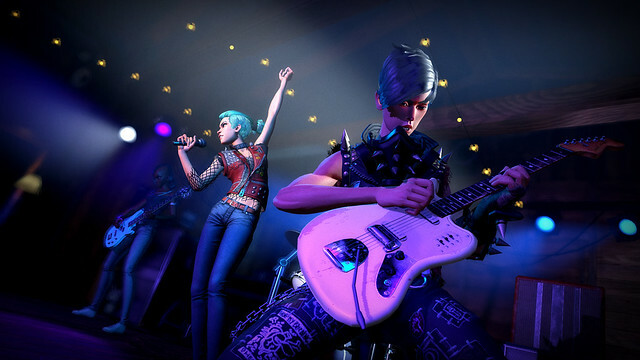 Previously exported legacy Rock Band titles can be downloaded for free to play in Rock Band 4 within the same console family as we make that content available. At this time there is no way to export legacy Rock Band titles directly into Rock Band 4. Thanks for the reply Criss! Waiting anxiously! The compatibility lists mentioned Guitar Hero 3 wireless. Thing is, I wonder if the Guitar Hero 3 Gibson SG wired guitar for PS2 will work with Rock Band 4. When will the 10 packs of songs for pre-orders be available? I downloaded the game, but I don’t see an option to download the songs. Your PlayStation Pre-Order bonus tracks should be made available when the game has officially released worldwide, which will be tomorrow! Will Rock Band Network songs (so many good metal jams from there lolol) work with the PS4 eventually, if at all??? Just check the following link. SO happy all Amberian Dawn songs will be compatible >=D. Rock Band Network tracks will not be available for re-download in Rock Band 4. Seriously, Harmonix? Then why do you have a link to a list of songs that include Rock Band Network songs in a page that says Rock Band 4 will have a lot of artists? Now I have wasted money on Rock Band Network songs hoping to play them day one… Thanks again ¬¬. Am I able to download my legacy content before release? I have the game preloaded already on my PS4. Thank you for this answer. I was getting a little worried. I think how just like what you did with The Beatles. A Michael Jackson Rock Band. Would be awesome. He had a lot of songs that were good for guitars. I agree, but I think future packs will be released as DLC not as discs. Hoping for a return of the keys as well. Yeah, aha… Thank you SO MUCH for delaying the game in Mexico. I feel SO HAPPY about playing it half a month later. Harmonix IS THE BEST! Hate Mexico, hate being mexican, hate everything here. Just logged in to Playstation Store on my PS4..
Q: A FEW of my songs were there, listed as ‘Free’ but most says ‘Unavailable’ .. Is this just pre-launch weirdness? Planning to pick up my pre-order with new instruments tomorrow, Mine are trashed! Hope the cymbals are out soon. No answer to the last several people who mentioned this. Please, please make RB1, RB2 and RB3 content import capable into RB4. It seems like you would be able to check the PS3 disc or our game history to know we own RB1, RB2 and RB3. Or how about offering RB1, RB2 and RB3 Disc Packs at a discounted price for those who can authenticate the games discs. There are way, WAY to many amazing songs to leave behind. Oh yeah, thanks for bringing RB4 to the PS4! I am so excited to play late this evening! 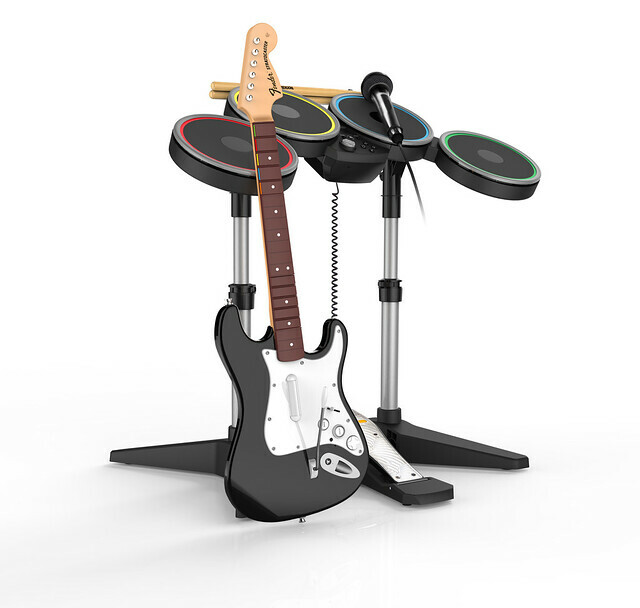 I have a 7 year old that I am going to introduce to Rock Band 4. I am hoping he gets hooked like me! ROCK ON!! One more thing, please release more Scorpions, RATT, Van Halen, Vince Neil Exposed, Motley Crue and Def Leppard in RB4. Also, find a way to get Led Zepplin, Tool and Perfect Circle on to RB4! TIA! Hey there! Thanks for the support! We have not left behind those songs on legacy Rock Band discs. If it was previously exported, it will be available to you for free re-download within the same console family as we make that content available. We continue to pursue more export options later on down the road! 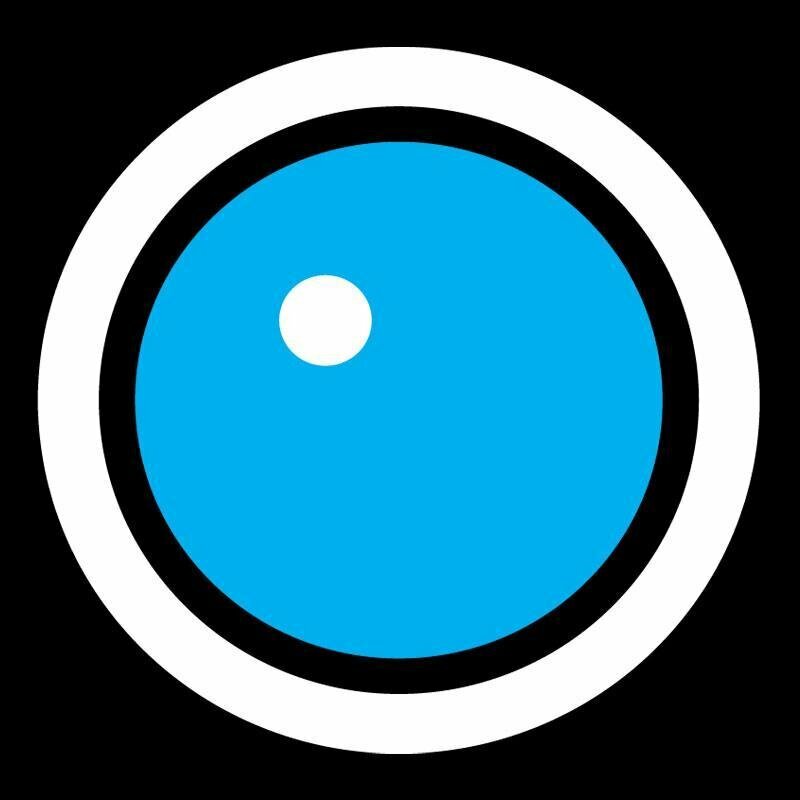 Did you know we have a song request portal? Tell us your favorite songs that you want to play in Rock Band 4 using this submission form: rockband.com/request! Does the Band Hero instruments (guitar, drums and mic) (ps2) compatible with Rock Band 4? Hey Harmonix! huge BIG BIG BIG fan here. However, I seem to have no access to ALOT of my DLC. This is being fixed an launch, or much later? All packs and albums I can’t re-download, at all. I tried to list the songs I can’t access but the comment was too long. I’ve been looking forward to this game for years and years, I’m so excited! I used the online store to transfer a bunch of my DLC to my PS4 last night. The process is a bit tedious, and yet it’s also pretty satisfying to fill up cart after cart with 10 songs at a time, all marked as FREE. I love this franchise and i’make sooooooo ooooooooh happy to see it return. Thank you for all your had work making it! While I’d LOVE to get this (and guitar and mic) for PS4, I have to wait and get it no xbox one. Since Sony and Microsoft can’t get along and allow our legacy dlc to be cross-family platform (ie dlc currently on 360 but play it on PS4), it only makes sense to keep my Rocking on MS console. That way I also don’t have to buy new instruments. I wish it didn’t have to be that way but at the very least it’s an extra excuse to have an xbox one sitting next to my PS4. I don’t blame Harmonix in this (they’d allow cross-family dlc if they could), and I can’t wait for the Amplitude HD remake to come out. Same here. I don’t even own an xbox one since I picked PS4 this generation. Sadly, I don’t know when I’m going to pick up Rock Band 4. Wishing more of these songs were ones I heard of. I might end up liking them when I hear them once I play this tomorrow but the real question is how do we download all of our dlc from the PS3 to the PS4? Also is there any way to transfer rock band 2 and Rockband 3 disc songs to rock band 4 from our PS3 to the PS4? We still have to plug in the dongle to the PS4 to make the guitar active we dont have any option to sync the guitar somehow? What about those who preordered from Amazon? How will our preorder bonus be delivered? I asked Amazon about this same thing and they said it should be emailed shortly after delivery. I guess they want to make sure you aren’t going to cancel first. I don’t see any Rock Band DLC in the PS store. How do we import legacy DLC (from PS3) to PS4? Still haven’t pre-ordered, am very much still on the fence along with a lot of other people. -will keyboard support be added for legacy songs post-release? -will keyboard support be added for use as bass/guitar post-release? -are new RB4 songs encoded with higher-quality audio? -are legacy songs re-encoded with higher-quality audio? -will there be a new RBN for RB4? if so, will I be able to author/test on my PS4? Thanks for letting us know that RBN tracks aren’t importable into RB4, I appreciate you answering questions quickly and honestly. I’m very excited for RB4, I only had the first RB and I still play it today. I play the drum set mostly because I was in band when I was younger and played the drum set a lot and this resembles it most. My drum set on RB are torn to pieces, I have to put pillows under the snare drum (red drum) because it broke 3 different times and the green drum/cymbal I had to glue a number of times. The heads of my drums are all ripped off from wear and tear and I’ve broken over 6 foot pedals. So this is why I’m very excited to get some new equiptment. Well, I was hoping that my Beatles Rock band would import/export, looks to not be the case. Now I have to rethink this, I have most of the sub-titles, and that is maybe something I need to think about. One more thing, are they individual only or are there theme packs for download such as a “classic rock” pack with a bundle of songs for cheaper? Huge fan since Frequency got released on PS2. Since 2007- (I’m crazy) I have collected every single piece of DLC you guys have released. On Xbox 360. That isn’t stopping me from picking up this game on PS4, in fact I bought the Guitar bundle & digital for PS4 & Xbox One. I am at Rock band 4 on ps store and there is no add on tab to download my old songs. Please help! Oh man… you’re not kidding. BABYMETAL DLC would be incredible. Oh wow… I just found out that there is BABYMETAL! It’s DLC. Since I already own them… will these DLC be available into RB4 later? I pre ordered on PSN. 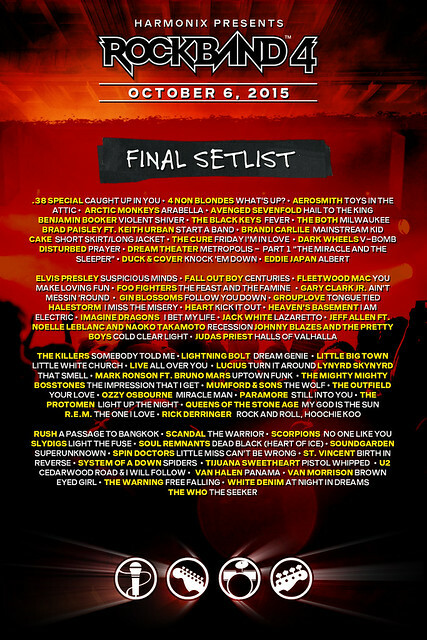 Cant find these free songs in the set list anywhere…Am I missing something? You’re not the only one. My PS+ subscription expires on the 7th as well… and I don’t plan on renewing. The game and the theme were added to my download list, but the 10 free songs for pre-ordering (which I did on the 5th) are nowhere to be seen. They should have automatically been added to my download list, or appeared in either the PSN Store on the PS4 or in the in-game store… nope. Will someone from Harmonix and/or SCEE please tell us what’s happening? If you search the PS Store for, PS Plus RB4 you will find the DLC pack and can download the songs. Youre gonna want to go the PS store, Search Rock Band 4 or find it under the new games like I did. Then go to Related items > View All. Sort price to free and it’ll be the last one. That’s how I found it. For some reason Harmonix has it on their support site to contact Playstation Support if you have issues but unless they have the work around on their end they might not be of any help besides letting you know they see you pre ordered the game. i buy RB4 on a store; I have a psn code for 30 free songs but it doesn’t work… is it normal ? No way ima go out n spend 400$ to play this game lol , Ya gotta buy the Instrument controls to even play this game. If i wanna jam i call the guys in the band and we do it for real lol . People who play this game , ya need to go out and buy Rocksmith and learn how to really play. I liked Guitar Hero but when i played Rocksmith for the 1st time i never played G Hero again. Rocksmith with keep your chops up in between jam days in your real band. RB4 Looks really kool but i can’t get myself to pretend to play ! Can someone help me with this problem so I just got the Rb4 Disc and am now playing on my PS4 I am using my old equipment from the PS3 rb2 bundle. First I am not able to sign into my PS4 profile on the guitar when I click on guitar it goes right away to guest when I turn on my PS4 controller it right away shows my online id Saab01 how Do I change this ???? Also on the guitar when I click on the ps button to go back to the main menu it doesn’t work any way to fix this problem. So I noticed all Green Day songs available for download I have to purchase. I’m fairly certain I exported them to RB3. Was I supposed to do an ADDITIONAL export to RB4 to get them for free? Also, can we expect more songs to become available weekly? Daily? How can I purchase a 2nd Playstation 4 guitar for my copy of Rockband? I cannot find them for sale anywhere. How exactly do I port over my songs from rock band 3? If I’m honest, I’m a bit disappointed. The game is great as it always was but I bought this on the premise that I could download all previously purchased RB1/2/3 DLC titles (and ideally disc sets). Having tried unsuccessfully to download ANY of the 50 odd songs I bought for the PS3, I found out that these are not currently available. There was no mention that there would be a delay or gradual roll out. Care to shed any light on this? I’m very happy that RB has returned, but as it stands currently, it’s not for me. Gone are the custom options we’re used to. The body types, accessories, piercings, tattoos, custom band logos…. all that fun design stuff. Gone are any forms of cut scenes or anything really hyping my band. As a player that’s a huge disappointment. With next gen, I think we expected a robust band performance. We’ve been given the repetitive, recycled, rehash of Rock Band 3 animations. Gone are days of RB1 and RB2 where character animations were diverse and unique via assigning an attitude. Each song was different feeling, now all the same. The life and energy is gone. This game gets amazingly lazing feeling after watching a single song. Please, Harmonix, I know this is a new platform, I know it can be expanded upon. Please bring the love of the player’s band back. They’re what brought me in to RB and what kept me playing for years. I want to love this game again, but I’m waiting to see what happens. I agree, this is just sad. I’m glad I kept my PS3 and RB 2 and 3. This game is so basic it’s not even funny. Loving the core experience in Rock Band 4 and looking forward to seeing how Harmonix fleshes it out over time. As a note for those waiting for confirmation: despite the compatibility chart indicating otherwise, MIDI drums with the PS3 MIDI Pro Adapter are working flawlessly for me. Obviously the keys and guitar functions of the adapter are meaningless with the new title, and at this point the Xbox One doesn’t provide similar support, but this was critical for my adoption of the new title and it works like a charm. I am curious about the bonus tracks promised for Playstation Plus pre-orders of RB4. Presumably that’s one of the packs still being worked on? I never received a code or any other communication beyond the promise here and on the purchase page that the tracks would be made available. A little more communication about work that’s still in progress wouldn’t go amiss. What about the Wii downloads. I bought 300+ songs for the Wii, that was a lot of money invested in RB3. Now I have to start over because of a platform change for RB4? I bought a PS4, pre-ordered RB4 Band in a box (another $700+ spent) but I can’t get credit for all the song I purchased for RB3?!?!?!? I really wish I hadn’t preordered this game. It’s so bare bones! The character models all look like skinny preteens…it’s just awful. Why can’t I make a character that reflects who I am in this “next gen” game? I can’t find anything next gen about it and it was not worth $60. I had accepted that we lost keys and pro guitars, but the fact that we have like five faces to choose from and three hairstyles and one body type is ridiculous. I’m hoping I can get a refund and I’ll go back to the far superior RB 3 which is a full game unlike this demo. I really dislike it also! Its 30 minutes till the 7th and no 10 free dlc pre order songs! Any idea how much longer? Will there ever be online multiplayer for quickplay or any of the modes? I am kind of bummed out the main playing feature online for RB titles is not on this one! My internet connection is working fine in every other aspect of using my PS4, but when I try to go to “Get More Songs” from within the game, it tells me that it can’t connect to the server. Haven’t even been able to do it once successfully. Also, and this is my more pressing issue, many of my songs show up as “Unavailable” when I go to the Playstation Store and go that route of downloading my old DLC. I’ve discovered that songs I bought in packs are the ones with that problem, so then I go search out the pack, and IF I can find it (for instance the PAX Charity Pack from 2008 isn’t searchable, but “Livin’ at the Corner of Dude and Catastrophe” from it is…but it’s Unavailable. I also found that songs I bought individually, and then LATER got the pack they’re from prevents me from being to download either the single song I originally downloaded or the pack its from. For instance: I bought “Mr. Crowley” by Ozzy Osbourne and then a day later got the rest of the Ozzy Osbourne 8-Pack. Now I can’t get either of them. If there’s a fix coming for this soon, as well as an easier way to see all the songs I’ve downloaded in one place, an update on that would be greatly appreciated! I see many songs that I have purchased in the past pop up with a price to buy again. Will this be fixed? I’m curious. Will the PS4 guitar work with my PS3 system to play the older titles? First off, Thank You Harmonix and everyone involved for bringing this back to life, and especially for the support from the previous DLC and titles. Without that, I would not have been purchasing the new one. 1) I get an error when attempting to download the Offspring Pack (something like WC-####…) and it will not download it. I previously had owned this DLC. 2) Is there any psn/store setting to make searching and downloading hundreds of songs of previously owned DLC easier? I realize this is not necessarily your problem to fix, but someone may have an answer or you may be able to push Sony for one. The filters and sorting options are limited. After “purchasing/downloading” (free prior DLC) track, using “O” to go back starts back at the top of the list, rather than having memory of where it was. It retains memory if you don’t download it, which seems odd to me. Letter by letter sorting would be preferable. It is wholly obnoxious to sift through 1700+ items. I’ve also had this error with the Offspring pack as well, so there must be a problem with it on the server. Please fix this bug, thanks! Not sure where to go with this, but I played yesterday for the first time with my friend and for some reason the parts on vocals where you are supposed to hit the microphone on the palm of your hand doesn’t work. None of the times I tried even registered as me hitting it. Any idea why this is? I keep trying to like it…but these boring customization options are ruining it for me on top of the other things. 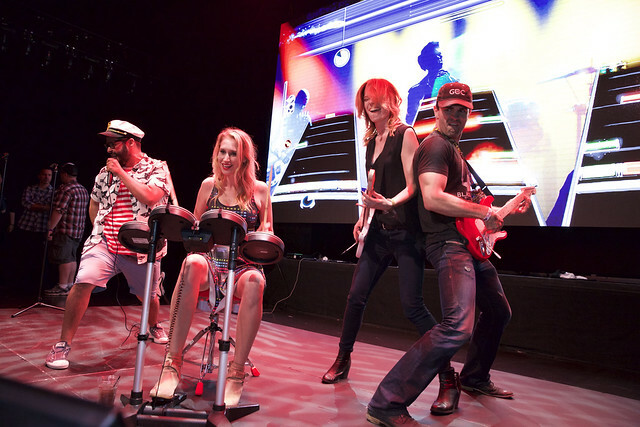 Got the band back together and rocked out last night…what a blast! I have wired drums from rockband 3 (ps3), but they dont seem to work on my rockband 4 for ps4. Am i missing something? the light is red around the ps button on the drums when plugged in, but i cant do anything. Please help!